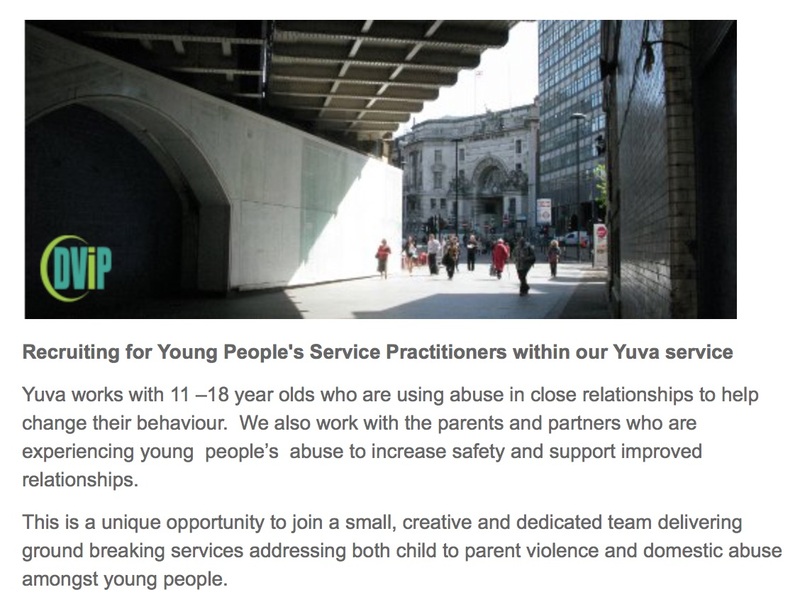 DVIP are advertising for a YUVA Young People’s Service Manager and Yuva Young People’s Service Administrator. Closing date 7th December. See website for more details. DVIP currently have a vacancy for a part-time Young People’s Service Practitioner (female only), working across London. The service offers support and interventions to young people using abuse alongside a parallel support service for parents and partners. You will primarily work with parents experiencing young people’s abuse to help re-establish safe boundaries within the home and to develop improved family interactions. You will also work with young people. There are also opportunities for sessional work and volunteering. Full details can be found on the DVIP website. More information is now available about the workshops and presentations planned for the Respect National Practitioners’ Seminar on July 4th. This is the sixth seminar of its kind, for those addressing young people’s use of violence in close relationships, and will be held this year in London. Of particular interest to those in the field of parent abuse will be a presentation about the Yuva Project. Shem Williams, from DVIP, will be talking about their work on adolescent to parent violence. Peter Misch also returns after a successful presentation last year. This year he discusses Empathy Deficits from a mental health perspective. And there are two presentations about the work of Respect and the young people’s project itself. The full programme of speakers and booking forms are available on the Respect website.